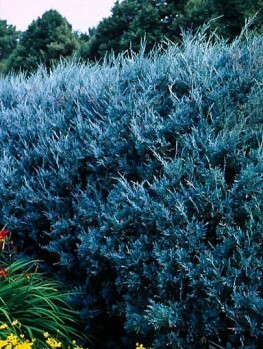 If you have hot, dry and stony areas to deal with, the Blue Star Juniper wants to be your friend. It will thrive in those harsh places and always look colorful and healthy. Even when the thermometer falls to minus 30 this juniper will never burn or fade away and it will be the star of your garden in all seasons. 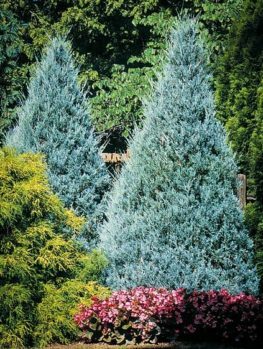 A great virtue with evergreens is the variety of foliage color, which persists all year and brightens the garden at all seasons. 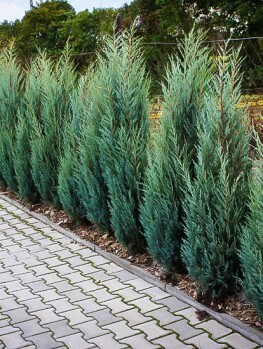 The Blue Star Juniper has vibrant blue foliage that really puts a zing into your planting, while it stays small enough to fit into the smallest spaces and even into a planter box. This little beauty will also tolerate poor and rocky soil, drought, urban conditions and even deer. 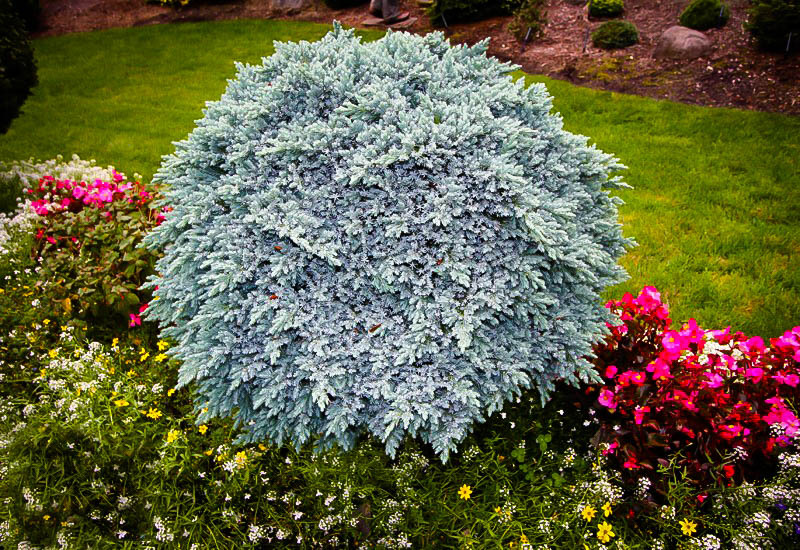 Planting shrubs of various sizes shape and color in your garden has more of an impact on your surrounding than just visual appeal. You are also helping improve the environment! Shrubs help filter pollution from the air while supplying the oxygen that’s needed by every living creature. Their solid root systems bed in to the soil, which helps to prevent erosion, and they can also be a great way to help maintain moisture levels in the earth around them. That has obvious benefits for nearby plants. 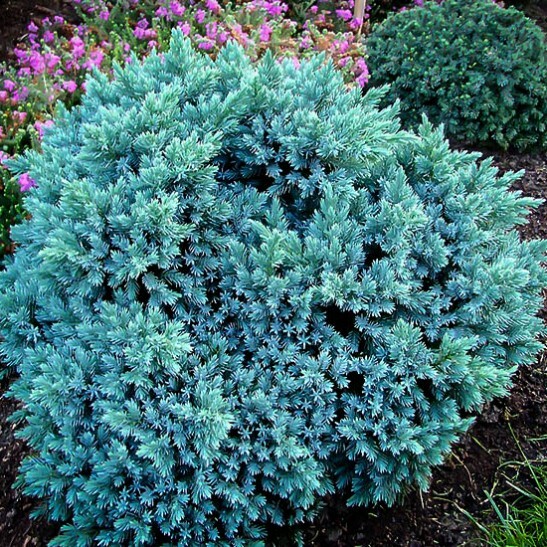 Evergreen shrubs like the Blue Star pack quite a punch even though they are somewhat small compared to other evergreens. 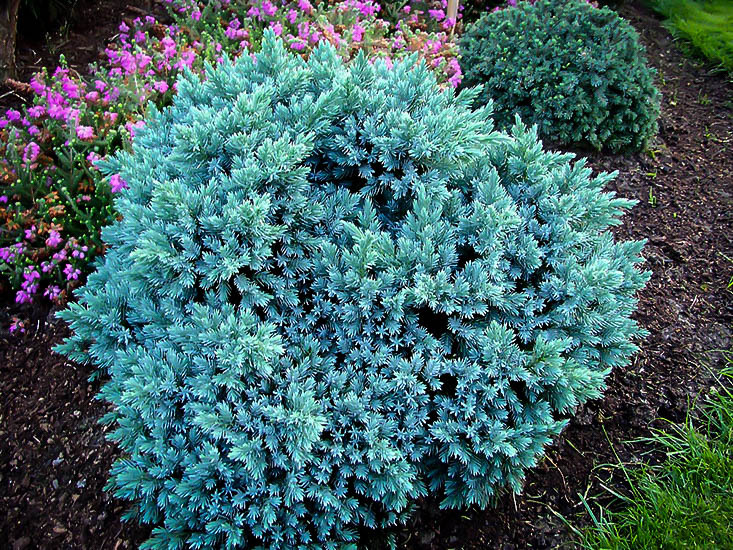 Their dense needle-type foliage, tinged with blue and silver, makes for a striking accent plant that can break up large areas of solid color; they make an even bigger impact when set alongside plants that produce complimenting color contrasts. The Blue Star juniper is native to several locations around the world. They are most commonly found in the Himalaya Mountains, northeastern Afghanistan and into western Yunnan in the southwest of China. The compact dwarf juniper only reaches a height of three feet at maturity and a width of just over three feet. It is also a moderately slow grower that doesn’t usually reach its mature size until after its fifth year of growth. Blue Star is not a ground hugging plant; this particular species grows upwards and outwards in a flowing mound-like shape. 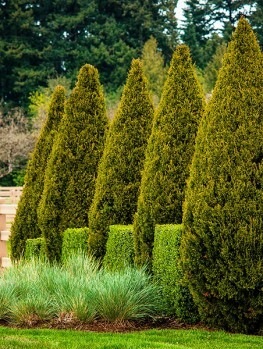 This shape makes it a great choice to fill wide areas of barren space while also adding a smooth transition from your lower growing plants to the taller trees in your scene. Multiple branches with dense blue and green needle-like foliage add a splash of color that can be used in a variety of design settings. Tiny oval bluish-colored cones that resemble small berries contain a single seed and grow nearly all year long. These small half-inch cones take about 18 months to fully mature before shedding their pollen in early spring. Thanks to the juniper’s evergreen nature, this small but versatile plant holds its color all year round. The constant color of these plants allow for visual enjoyment throughout the winter months which can sometimes be dark and dreary. 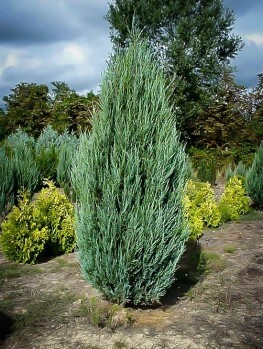 This Blue Star Juniper Shrub is suitable for planting in USDA plant hardiness zones 4 to 8. They prefer a moderate climate and are not suitable for locations that are both hot and extremely humid. It can thrive through the cold winters of Minnesota and even Montana, but will also enjoy the northern parts of some Southern states like Georgia and Florida. Adding to the versatility of this juniper is the fact that it is quite easy to grow in pretty much any kind of soil. As long as the plant has adequate water and is displayed in locations where it can receive the full sun, this is one tiny shrub that is more than happy to settle in for the long term. 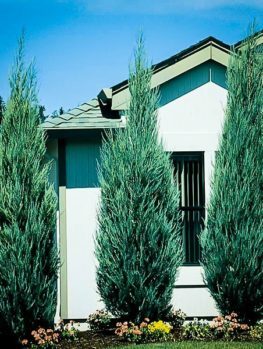 Too much shade can be detrimental for these shrubs so you will want to make sure that, even though it is small and low to the ground, it’s placed to receive as much sunlight as possible throughout the day. It is also tolerant of mild bouts of drought. In order to prevent any stress to the plant, though, you will want to adopt an appropriate watering schedule during the hotter seasons especially in locations where you might go great lengths of time without rain. When it comes to taking care of the Blue Star Juniper you will be pleased to know that it doesn’t require a lot of attention. As with many other plants, you will want to ensure that the shrub gets enough water for its first growing season. This will allow the plant to bed in and let its root system become well established in its new home. Once it has made itself at home, regular watering can be reduced. Since the shrub is a slow grower you may not notice its expansion over the years as much as with some faster growing plants. It also likes to look a little unruly in the shape and form aspects, but if you want a more uniform look you can pinch off new growth before it begins in the spring as well as removing dead or dying branches throughout the year. It can tolerate mild pruning throughout the season if necessary. 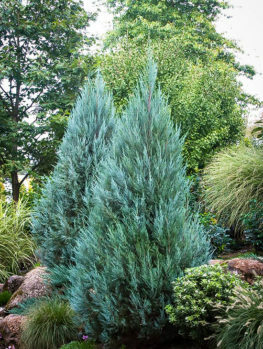 By incorporating the Blue Star Juniper Shrub into your landscape design, you will be able to create an eye-catching garden that will make your neighbors turn their heads each time they pass. 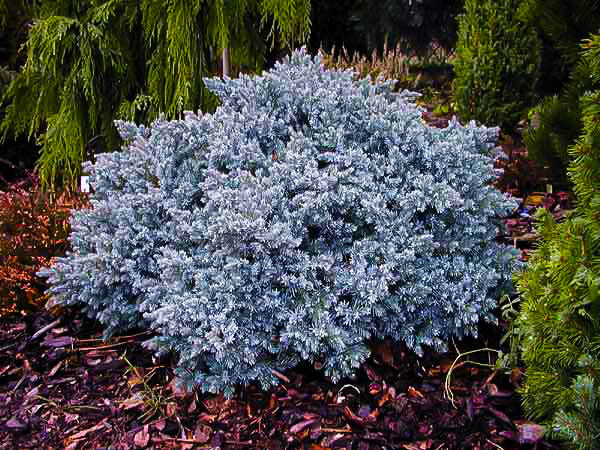 Dwarf shrubs like this one are effective choices for areas with limited space, while larger spaces can benefit from the shrub’s versatility by becoming border plants. No other shrub can bring you the many differences that the Blue Star Juniper can and you will be hard pressed to find another plant quite like it. Don’t pass this one up if you want to create the perfect outdoor living space.